I hope you'll forgive a shortish post today. My brain is tired. And we're going to be spending the next 7 days with Enigma, so we'll have plenty of time to talk about it. 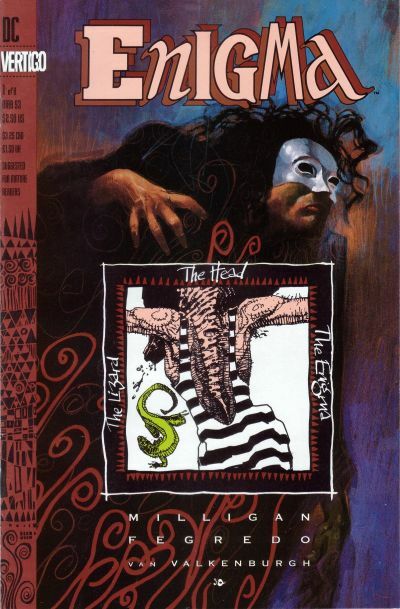 I've actually only recently re-read this series, as I've started (re)discovering the works of Peter Milligan. I read his early Batman stories a few weeks back and was really quite taken with his work. Enigma is a very different kind of superhero story. I first read Mr. Milligan in his follow-up to Grant Morrison's Animal Man, a short (7 issues, I think) little tale about a very strange alternate reality. And his turn on Shade, the Changing Man ranks as one of my favourite comics ever. So I figured it's about time I checked out some of his other work. Today's issue is very much set-up. We meet Michael Smith and his very normal life, described by one character as so normal that it's weird. Which is a fair assessment, actually. But things cease to be normal very quickly. The Head appears on the scene, sucking out peoples' brains, and a strange masked man is seen around the crime scenes, a man that Michael is sure he used to dream of as a child.